Is that a thing? I’m not sure… but we’re going to go with it because I have three things to share with you! 1. Today is a cross training day. I did a level 3 30 day shred workout. 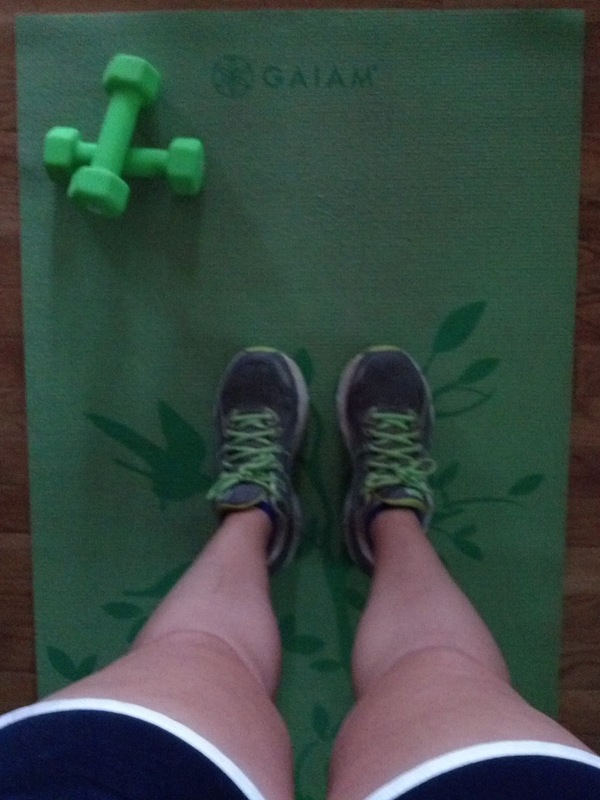 I really like these Jillian Michaels workouts (as you have probably noticed). The workout itself is 27 minutes from start to finish, including the warm up and cool down, and I always sweat buckets which tells me I’m working hard. 2. Do you remember how awhile back there was a bird’s nest in one of my hanging flower baskets that had eggs in it? I don’t know if I ever updated you on that, but those eggs hatched. There were little baby birds in the nest for awhile and then they eventually left the nest. Well now there are nests in all three of my hanging baskets! I’m not sure how long it takes for birds to mature and start laying eggs, but I’m wondering if it’s possible these nests and eggs are from the original babies. This last one is balanced on the stems of the flowers, whereas the other two are actually on the potting soil. I have to be really careful not to knock the nest out when I’m taking the basket down to water it and putting it back up. 3. Last night’s sunset was really pretty. It’s not the best picture, but I really liked the way the sun was right in-between those two clouds. We get a lot of pretty sunsets this time of the year, because the sun sets directly behind our house in the summer. In the winter it still sets behind the mountains, but it’s off to the left a bit. Tell me three tangents about your day! They are so fun to watch! So precious. 1. I had a bowl of cereal for breakfast, followed by 6 sour gummy bears. Don’t judge. 2. I think (hope) I’m finally over jet lag? Good sleep for 2 of the past 3 nights. Weirdest jet lag issues EVER, after this most recent trip. 3. I think I’m going to the gym twice today…lunchtime spin and evening yoga. Whoops! Glad you’re finally over the jet lag! 1. Didn’t go to work until 10am today. Had to drive to Dahlgren for a VTC with folks in the PDT and we didn’t start until 12 EDT. 2. Stopped and had dinner with Aunt Bea and Uncle Harry a the nursing home. Had a good time bit was late getting home. 3. Had to get to the store to get my stuff for the reunoin this weekend. All Star Relays got moved to 5pm due to heat and won’t be over until late (9:30) and the developmental relay carnival at home pool on Thursday. Meet and celebration of Kevin’s 44 years on Saturday, then off to PA.
Yep, that’s three tangents. Hope All Stars went well! Wish I was able to make it up for the reunion…. next year. Those eggs are precious. I love the picture of the little baby, too! Sunsets are so pretty when you can see the rays beaming through the clouds. 3 – House on Pooh Corner starts on Monday and Andrew wants to play Tigger. We’ll see! 1. Productive day at work, but I was a little stir crazy because I didn’t get out all day. 2. AWESOME 7-mile trail race in the evening. Set a PR and felt great, despite the blistering heat. 3. Working out at night does not agree with me. Could NOT get to sleep. Will be running on empty today, but totally worth it! First off I love that your dad always comments on your blog. That’s so sweet! I don’t think my dad knows what a blog is. Secondly sounds like you are a regular bird hatchery over there. 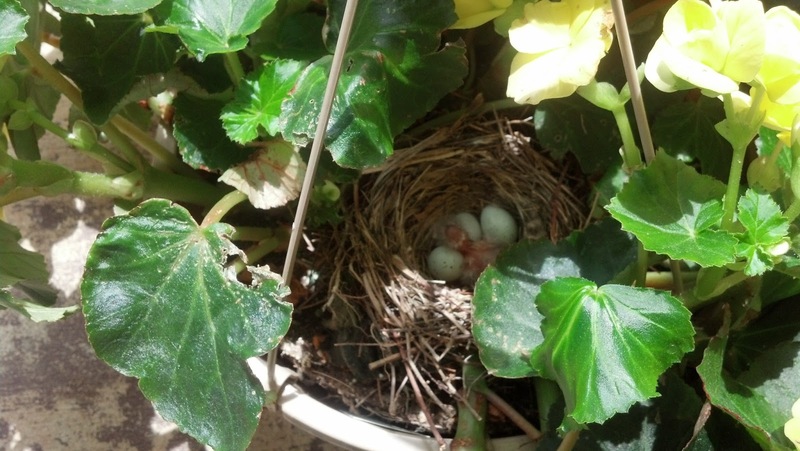 I had a nest in my hanging basket one year, too. It definitely made watering the basket a little tough! We practically have Robins coming out of our ears! The watering is definitely a challenge. My goodness you are sprouting a lot of birds! I convinced a hot yoga place that even though my Groupon expired in June that they should still validate it through November. Score. I’m getting a new office at work, so I got to pick out some new furniture today, which was really fun. I’ve got a 7 mile run on the plan today and I didn’t drag myself out of bed to do it this morning. Says it “feels like” 100 outside right now. So THATS going to be fun. If I don’t blog for a few days, it means I died of heat exhaustion. Well done with the Groupon! How did you convince them? Hope you survived your 7 mile run! I’m sure Indy has sent out a search party by now if you haven’t returned yet. Cooper is probably eating your dinner for you, though. What color thumb does one have to “grow” baby birds? 1. My early morning running client ran about 50% more than she usually does! 3. Daniel talked me into making chocolate chip cookies last night. I haven’t made them in forever! It has been so hot this week, hasn’t it?